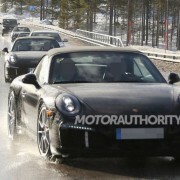 There has been some recent important activity on the Porsche`s behalf lately, as its engineers were busy testing the latest 2016 Porsche 911 Carrera Cabriolet along with other models, during which spy photographers have managed to lay their eyes on the car. There wasn’t one, but a real armada of Porsches being put to some harsh tests at the Artic Circle. We are talking about prototypes of the future Porsche 911 Carrera Cabriolet, standard 911 Carrera or the state of the art 911 Turbo. 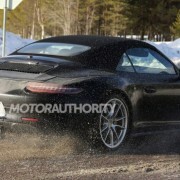 We could only get the 911 Carrera Cabriolet in the spy shots, the mid-range supercar that would be debuting at the end of the year. The car comes with some fine touches. At the front, we are talking about a new bumper with fresh air intakes, along with updated daytime running lights, with a possibility of a revised active grille for a better fuel-efficiency. The rear of the car also receives some tweaks like new intakes, as well at the sides of the bumper, which might be regarded as significant changes brought to the car. The entire 911 Carrera lineup is expecting to receive updates to their engines as well, with the present 911 Carrera model having a 3.4-liter flat-six engine and the Carrera S model sporting a 3.8-liter flat-six engine. Stay tuned for more upcoming details.